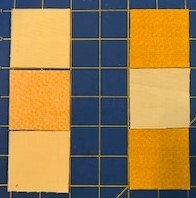 Nine patches are the ultimate all-purpose grid for quilt blocks. 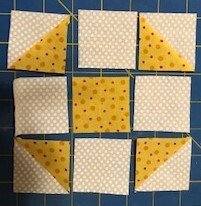 It also just so happens that it is a size that works out beautifully for Tiny Tuesdays 5 inch blocks (4.5 inch finished). 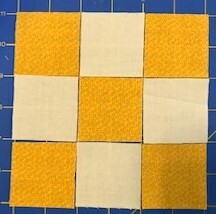 Before you dismiss the humble nine patch, start to think about some of the classic quilt blocks that are built on a 3 by 3 grid. Churn Dash. Ohio Star. Friendship Star. The list could go on. 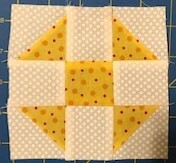 I'll show you the basic nine patch first and then Shoo Fly, which is a nine patch with half square triangles in the corners. Start with 9 2 inch squares. I did 4 light and 5 dark, but you could reverse that for a slightly different effect. 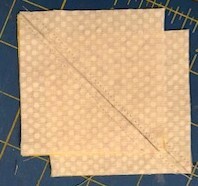 Lay the two inch squares out in an alternating pattern. Stack row two onto row 1, right sides together. Chain stitch the tree pairs together, keeping them joined. Open row 1 and 2 and sew the third block to the end of each block in row 2. The webbing really helps to make sure all the blocks stay in the right order. You can press now or later. I did it now so that you could see the seams pressed toward the dark fabric. This will allow the seams to nest nicely. Press your final block while you ponder all the variations you could whip up starting with this simple block. Shoo Fly is another nine patch block. Just with half square triangles in the corners. 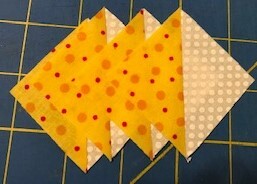 There are so many ways to make a half square triangle. 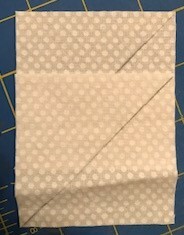 I usually use my handy dandy easy angle ruler for large batches, but for just 4 HSTs, sewing larger squares along the diagonal and then trimming them to size seemed easier. You will still need 5 2 inch squares (1 dark and 4 light). 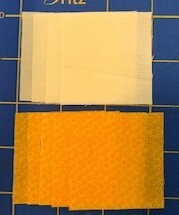 In addition you will need 4 2.5 inch squares ( 2 dark and 2 light). 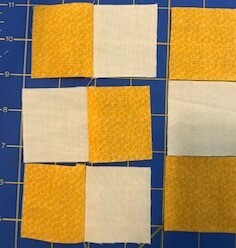 I had 3 inch squares on hand, so I used those. They will be trimmed at the end, so the exact size isn't critical here. 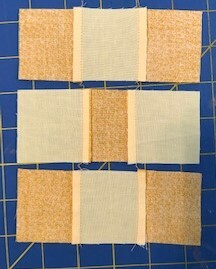 The rule says to add 7/8 an inch to the finished size or 1 inch if you plan to trim them down. Draw a line on the back of both light squares. Place light and dark squares right sides together. Sew a quarter of an inch from both sides of that line. Use scissors or a rotary cutter cut on the drawn line. Square your 4 HST units up to 2 inches. Lay all 9 squares out with the HST units in each corner. If you moved the HST units to the center of each side you could also make a friendship star right now. If you replaced the light squares on the edges with a set made from 2.25 inch strips, you could make a Churn Dash. This time I pressed away from the HST units in order to reduce bulk. 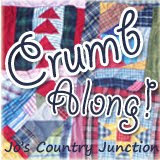 You may choose either block if you are on schedule for the 49 block quilt. Feel free to make both if you are looking for more blocks. 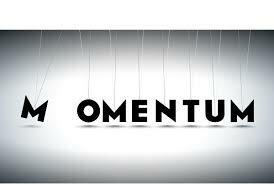 This week is a diagonal setting. 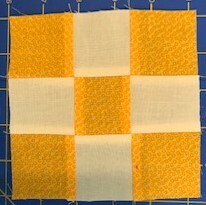 For purposes of the quilt, are we to make both blocks or just choose one? For this quilt, are we making both? Can't go wrong with 9-patch blocks! I made both of them. Nine patch blocks are pretty versatile. Thanks for the tutorial. SOST with the cute!!! I'm not sure how long I'll be able to hold out before jumping into the fray. Yay! Auto correct. I typed STOP! !